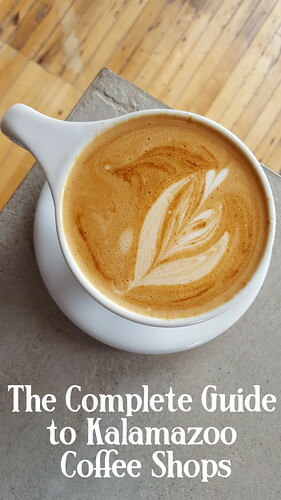 I was certain the alarms would start immediately after I entered the building. After all, here I was a Lakers fan, entering the Naismith Memorial Basketball Hall of Fame in Springfield, Massachusetts—just a quick spin up the highway from Boston, home of the dreaded Celtics. And a quicker spin from my nice room at the new MGM Springfield nearby. But no, they let me in: nobody patted me down for contraband pictures of Magic Johnson, and I wasn’t taken to a room where a guy with a cigar who looked like Red Auerbach had me under hot lights to dress me down. 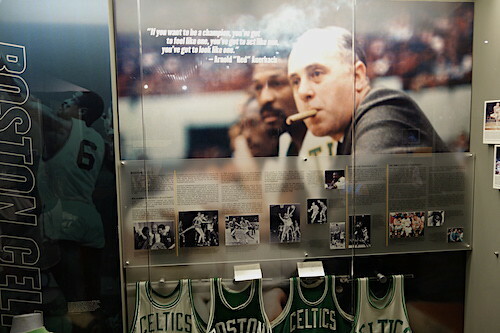 Instead, I entered 40,000-square feet of hoops history, where imposing tributes to the most heralded figures in the sport are mixed with some of the game’s earliest and most humble moments. So much to see just from stepping into the entrance! I was delighted to note a giant panel of Elgin Baylor, my favorite Laker from the 60s, who was Jordan before there was Jordan. 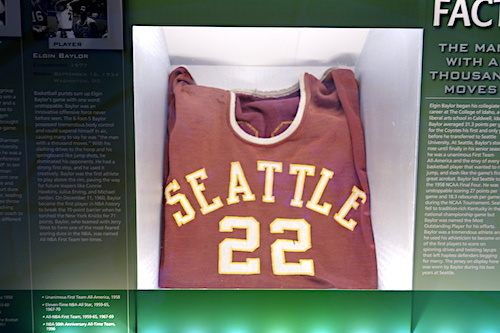 Later, I saw in a glass case another Elgin exhibit, showing his jersey from his days at Seattle University. 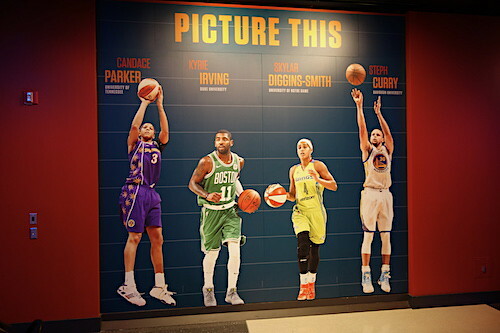 And that speaks of the deep inclusiveness of the Hall: The heroes that are enshrined here aren’t just NBA greats from the court; no, there’s deep attention paid to men's and women's college ball, to pro women's basketball, to revered coaches, and even to administrative leaders from the sport's first and present days. Speaking of the sport’s first days, there’s a lot of information about Dr. James Naismith, the physical education teacher who came up with the notion of throwing a ball into peach baskets in the winter of 1891, as a means of perking up athletes who needed to heat up indoors during the Springfield winter. 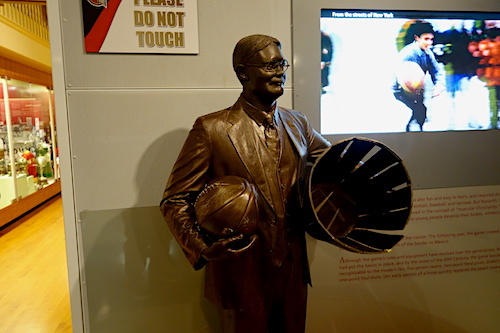 There’s a great statue of Naismith in the Hall. 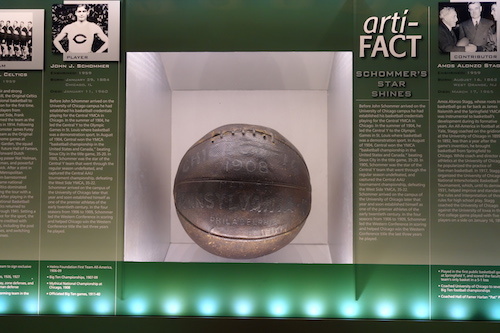 And there are number of what look like his original basketballs (or maybe big, beaten-up peaches) in some display cases, but in reading the information panels you find out that many of those are college balls from great teams of the distant past. There have been several incarnations of the Hall in its 50-year history; this three-level building openied in 2002, and its basketball-like circular design reflects its heritage. I heard some intriguing lore about those peach baskets from John Doleva, the President and CEO of the Naismith Memorial Basketball Hall of Fame: “I am fascinated by the creation of the backboard—the original game did not have one for many years after its invention. As peach baskets and other baskets were nailed up at YMCAs, which had the old-style running track above the gymnasium, fans used to congregate on the upper track at the opposing basket and use items such as umbrellas to block an opponent’s shot or knock the ball away. The backboard was created not as a shooting tool, but to deter fans from interfering in the game; players learned over time to use the backboard as a shooting asset,” says Doleva. I had a chance to try out those boards as shooting assets down on the first floor’s center court, a full-size court where many Hall events, both ceremonial and sporting, are conducted. The court also hosts live clinics and shooting contests. My mid-range jumper finally did start to fall after many falterings. 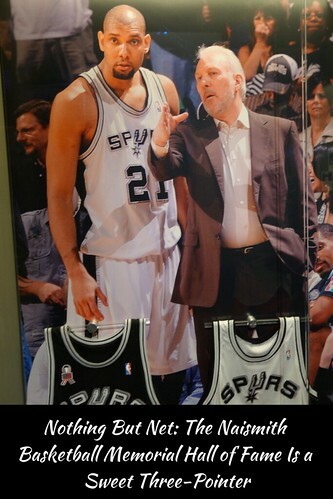 It was pure delight for me to sink baskets at the Hall of Fame! 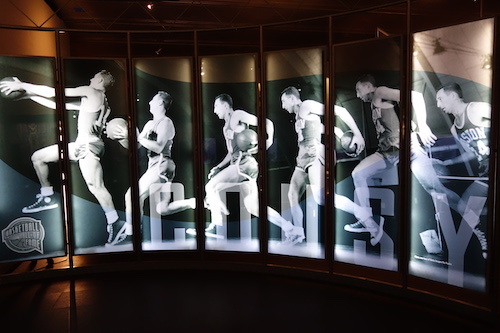 Personal sweat aside, there is so much to see: hundreds of interactive exhibits, panels of photos with 360-degree views, screens all over the place showing intense moments from famous games in basketball history. 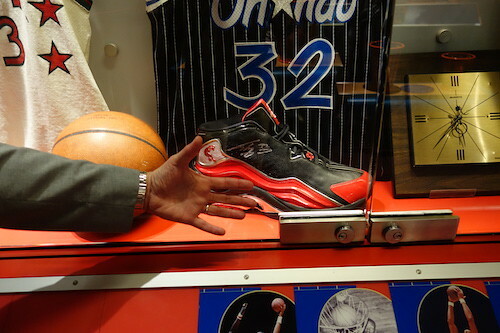 You can marvel at Shaquille O’Neal’s size 22 shoe, the enormity of which was underscored when Paul Lambert, the VP of Enshrinement Services and Community Engagement—and our very amiable and enthusiastic guide—put his hand next to it. Shaq’s gunboat made a man’s hand look like a schoolboy’s. In the upper levels on the high walls circling the room are large illuminated photos of the sport’s luminaries, both players and “civilians.” It’s a beautiful display, but as Lambert explained, the Hall executives are putting in plans to refurbish some areas of the building, so those images might have a rebirth elsewhere. 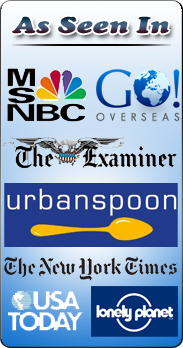 However they arrange them, I’m sure they’ll do it with class. The whole operation is first-rate. And this is living history. As John Doleva says, “From my perspective, what makes a great sports museum experience are things that are unique and can’t be found via searching on a device. As you walked through, you might remember the early game gallery; the footwear, uniforms, balls (the original was a soccer ball); the rule books and other memorabilia that show the evolution of the game—how it began, how it was played, and how the game and everything around it has matured. And just to show you that I’m not truly anti-Celtic, I spent some time admiring a beautiful montage of large photographs of Bob Cousy putting the ball around his back on the way to the basket. Though I have to say that the statue of Larry Bird there was a little disconcerting: the man is no George Clooney, but this particular rendition is no fellow you want marrying your sister. There are some nice touches outside the Hall too, like the stone seating “pods” with notations about basketball notables. 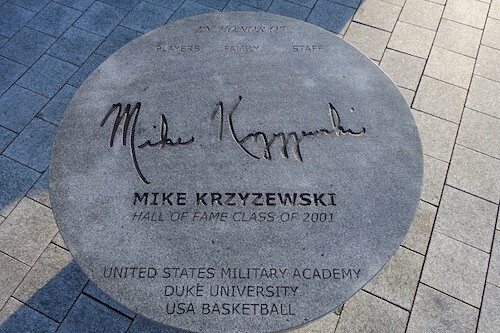 So you can see how to properly spell Mike Krzyzewski’s name and the like. We had a great tour, but as with all fine museums, I didn’t have time to take it all in. I’ll be back, but with shorts next time—I need to work on my three-pointers.